"I have learned enhanced techniques and now have improved posture and alignment"
"I enjoyed the people, the instructor, and the music. 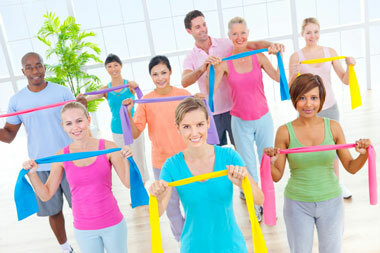 The music was peppy and made the exercise feel more like dancing"
"I feel great when I am taking the Zumba class. I've taking Zumba for over a year now and have NOT found any Zumba instructor anywhere else like the VIVA instructor"
"The Piloxing class that I attended helped me to socialize one night a week, get out of a gym setting, and have fun while working out. This class increased my upper body strength and my balance and core strength. I enjoyed the atmosphere created by the instructor. The exercises were easy to follow, but if having trouble, the instructor was right there to help. The music was upbeat and the routines were fun to perform"
"I take Pilates classes. I feel stronger, have no more back pain, and have learned a great deal about workout technique. I also have a flatter abdomen and a stronger body"
"I enjoy the time, the location near my home, the teacher and the people I am doing it with. No pretention at all and a very reasonable pricing"
"I have been taking weekly Viva Community Fitness classes for more years than I can remember. The main advantage for me is that Pilates helps to maintain flexibility and balance as we age---and our class has three people over 70, who are very solid examples. I definitely feel healthier and fit as a result of the classes. A second benefit, though an unintended one, is that through all these years the members of our class have developed a camaraderie that provides humor and support and adds to the experience. Third, the instructors are excellent, not only capable and professional but personable and approachable. We love them all. I continue to participate in the classes and have recommended them to several people. Thank you"
"The extreme workout and the up to date pop music that makes you want to move. The time of class was 8-9 which was perfect in my schedule. Of course, loved Sheryl! She makes you work and sweat hard! There was nothing that I didn't like"